1.) Cause the reader to examine critically the easy assumptions of conventional SF; 2.) Provide data for reasoned speculation; 3.) Draw sharper lines between science fantasy, science fiction, and science fact (we do this not to discourage anyone from reading science fiction, but rather to increase our appreciation and understanding of these separate categories). Simonsen goes further, saying that science fiction unconcerned with science facts is in fact "anti-science" and "anti-technological." "Ares," he says, "doesn't want to give you ... gee-whiz, empty-headed bull." Despite this stance, Ares would never shy away from publishing games that "fly in the face of scientific theory and fact," since such games were nevertheless fun. Speaking for myself, it was never the mere presence of articles on science fact that bothered me so much as their judgmental, hectoring tone -- much like Simonsen's own editorial. As if to reinforce the magazine's editorial position, its first article is a lengthy one (5 pages) entitled "New Minds: The Promises of Artificial Intelligence," by Allan Terry and Frances Grimble. Needless to say, authors Terry and Grimble are decidedly negative in their estimation of A.I. 's prospects. David J. Ritchie provides a good article on "Adventures in Albion," which offers roleplaying conversions of some aspects of the wargame Albion: Land of Faerie from issue #11 for use with DragonQuest. Meanwhile, Greg Costikyan's "The 11 Billion Dollar Bottle of Wine" is, for me, the standout article of this issue and an example of the kind of article I wished Ares offered more often. The article looks at the possibilities for interstellar trade given certain technological and sociological assumptions. It's a fun article that equally employs real science, speculation, and common sense to present something that's interesting and, more importantly, gameable -- a far cry from so many of the articles in Ares. There are "Designer's Notes" for numerous SPI games, including Universe. Timothy Truman provides a four-page comic called "Star Trader!" that's loosely connected to this issue's integral game. "Science for Science Fiction" and "Facts for Fantasy" are back, as one would expect, after Simonsen's editorial. Also returning are reviews of movies (Time Bandits), books (Lord Darcy Investigates, among others), and games (several Dwarfstar games and Champions, along with more). Gerry Klug presents new rules and errata for DragonQuest, while John Butterfield does the same for Universe. 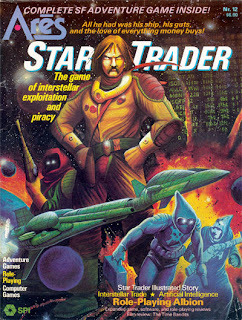 The remainder of the issue is devoted to StarTrader, a science fiction simulation by Nick Karp. It's intended to simulate interstellar trade in the 24th century, with up to six players taking on the roles of merchant princes in command of fleets of trading vessels, plying their wares across many worlds. There are rules for hyperjumps, combat, salvage, smuggling, passenger transport, and trade (of course! ), as well as those that cover high finance, reputation, and building new starships. StarTrader is quite extensive in its scope, without being too lengthy (it's under 20 pages). There are notes for using the game with Universe, which I think is terrific. Issue #12 was the last issue published by SPI before the magazine -- and its parent company -- were acquired by TSR. Consequently, issue #12 feels in retrospect like a bit of a swan song for Ares. It's actually a pretty good issue, or at least one of the few that I liked more than I disliked. Even so, as Redmond Simonsen's editorial at the start shows, Ares under SPI continued to present itself as a "serious" magazine with a specific style and focus that were held up in contrast to "other" periodicals, both within the hobby and without. Even though this meant that I rarely enjoyed Ares unreservedly, I nevertheless have to admire how Simonsen and SPI stubbornly kept to their vision for the magazine. This one was my favorite issue, probably because Star Trader is one of my favorite board games of all time! You have said exactly what I was going to say. Blaming "radical misinterpretation" is a weak writer's way of saying "the ideas were expressed poorly". "You idiots! You didn't understand my noble and brilliant ideas!" I sure hope so, cause James' description sure makes it sound very interesting. Though, this might also because of the date the game is set in: Just set it a century earlier, and you can have the players trade while trying to fend off Orks, Tyranids and other Xenos! Sweet Cover. I'm glad the guy from the Back Cover of DCC RPG made it to space. The cover seems to imply that the characters will be adventuring traders rather like Traveller characters or the Traders(?) from the Foundation series. Does the game live up to that? David Ritchie's article on Albion is my second favorite item out of everything Ares published, after the Albion game itself. I have a soft spot for space merchant-type games, and Star Trader was a good one. It's only real weakness is that it's limited to six planets with no possibility for any more. But that's a personal preference thing. It contains some clever ideas and plays more smoothly than the length of the rules suggest. Metagaming's "Trailblazer," which came out at about the same time (in a form that was uninspiring even for a microgame), was all about opening up new trade markets through exploration. I always wished the best of the two games could be combined. I've really enjoyed these looks back at Ares! In total, my take on it is that the magazine was a noble attempt to capitalize on the success of SPI's F/SF titles and inject some life back into the company's failing finances, but it took too long getting its legs under it (if it ever really did) to make much difference. That cover was painted by Tim Truman, who went on to do great work at TSR and still does fantasy illustration and comic books.